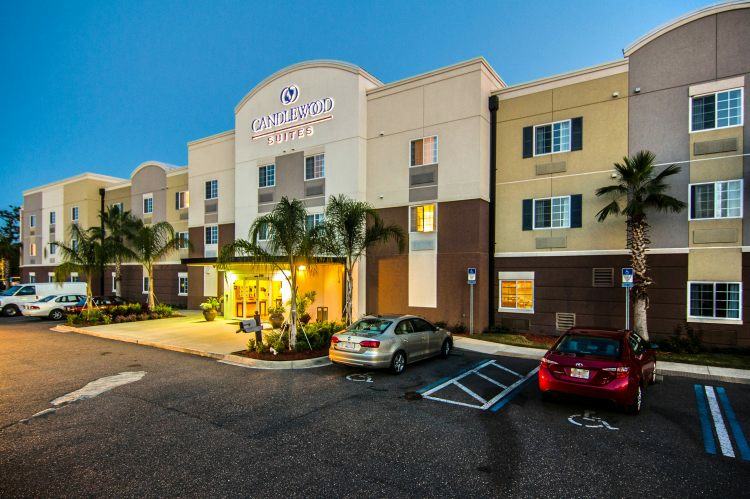 With freebies that include Wi-Fi and parking the value-priced Travelodge Inn & Suites Jacksonville Airport is a good deal especially since it's only minutes to the airport shopping and restaurants. 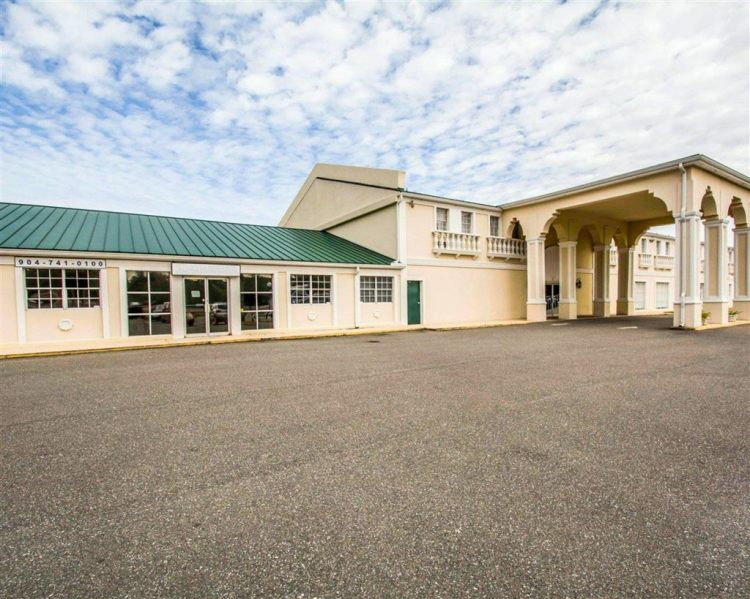 This two-story motel has 100 rooms some of which are non-smoking. All include conveniences like free Wi-Fi and premium cable with HBO and some have sofa beds. Amenities and services include an airport shuttle and a breakfast buffet. The hotel also offers a computer kiosk a lobby with a big-screen TV and Wi-Fi throughout the building. The large outdoor pool and palm-tree-lined sun deck are definitely a sight for sore eyes and the fitness center ain't bad either. Parking is free and you can bring your pet for an additional fee. Three miles from Jacksonville International Airport the hotel is just off I-95. Though there's no on-site restaurant there are tons of good restaurants a few minutes' walk away. The stores and restaurants at the River City Marketplace outdoor mall are less than a mile away too. Business travelers might appreciate that Mercedes-Benz Coach Biomet Microfixation and BAE Systems are all within a five-minute drive. And you can be downtown in 20 minutes flat since it's just 12 miles away. With such a budget-friendly price and convenient accouterments your travel bucks go far at this airport abode. 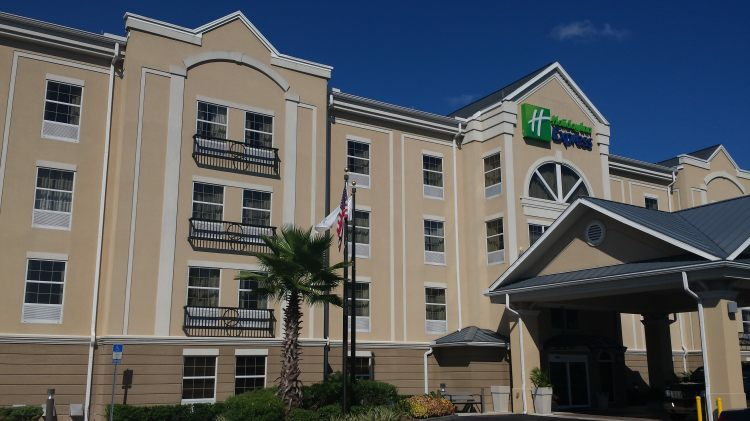 Plush beds free internet an outdoor pool and free airport shuttle make the Hilton Garden Inn Jacksonville Airport a top-notch selection for our guests who also like the free parking. The five-floor Hilton Garden Inn has 111 rooms all featuring the plush Garden Sleep System bed with adjustable mattress and cotton-rich sheets. You also get a coffeemaker mini-fridge microwave free internet and LCD flat-panel TV with premium cable. Some suites have jetted tubs. Your stay isn't complete without a swim in the outdoor pool. The hotel also has a fitness center 24-hour pavilion pantry laundry facility and grill restaurant serving breakfast and dinner. Parking is free of charge. You can hop a complimentary shuttle for service to and from the airport. The Hilton Garden Inn is just west of I-95 and one mile southeast of River City Marketplace mall. Downtown is 11 miles south. If you're driving or taking the shuttle from Jacksonville International Airport the hotel is two miles east. our guests take a flyer on the Hilton Garden Inn Jacksonville Airport for its "easy airport access" pool and rooms with oh-so-comfy beds. Plush platform beds an outdoor splash pool and an airport shuttle allow the non-smoking Aloft Jacksonville Airport to hit the heights with our guests. Not your typical cookie-cutter airport hotel Aloft maxes out on boutique style. Conceived as a smaller less expensive version of the W Hotel brand Aloft features chic decor with bold colors stripes and patterns. The five-floor hotel has 136 loft-like rooms with nine-foot ceilings and extra-large windows to let light in. All rooms come with mini-fridges available Wi-Fi and 42-inch LCD TVs with plug-and-play connectivity stations. The plush platform beds feature Serta mattresses dressed in cotton-rich sheets. The high energy doesn't stop with the rooms. Make your way to the outdoor heated splash pool camp Aloft for kids high-tech gym cool cocktail bar 24-hour gourmet snack bar and communal lounge. The hotel also has a free airport shuttle. The Aloft is located just east of I-95 a half-mile north of River City Marketplace mall and three miles east of the airport via car or airport shuttle. Downtown is 12 miles south. our guests find plenty to praise about the Aloft Jacksonville Airport where highlights include its "European feel" "energetic vibe" and "unique room design." 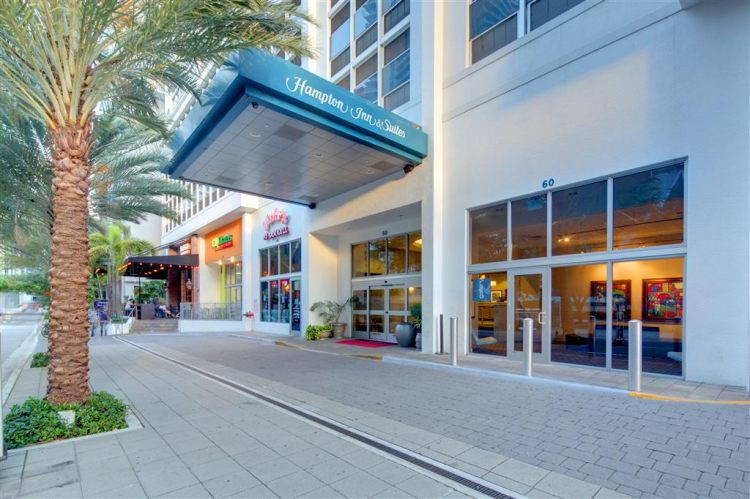 The stylish Jacksonville Plaza Hotel and Suites is a good place to land with free breakfast in a pleasant setting. This three-floor hotel has interior corridors and 100 rooms that include Wi-Fi microwaves mini-fridges comfortable beds and a light airy layout. Nice extras include a free continental breakfast and an exercise room. Airport shuttle service is free and extended cruise parking is available for an extra charge. 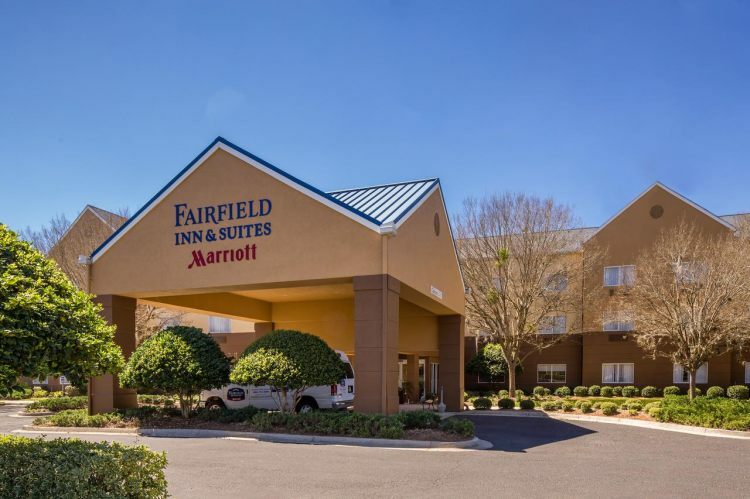 The hotel a mere five-minute drive from Jacksonville International Airport is right on "Restaurant Runway" with many favorite chains just a few minutes' walk away. River City Marketplace an outdoor shopping and dining hub is a three-minute drive. If you're here for business you're also a three-minute ride from Jacksonville International Tradeport home to BAE Systems Biomet Microfixation Coach Mercedes-Benz and Smurfit-Stone. JAXPORT Cruise Terminal is a 15-minute shot east. Other Northside attractions worth the diversion: Jacksonville Zoo and Anheuser-Busch free brewery tours just a 10-minute trip. And downtown Jacksonville is a 20-minute drive down I-95. Jacksonville Plaza Hotel and Suites is much more than just an affordable airport lodging say our guests who also praise the "friendly" staff.